On the weekend of my third Full Marathon, in 2014, seeking inspiration, I watched ‘Spirit of the Marathon.’ In the movie, Ryan Bradley was training for the Chicago Marathon to qualify for Boston. And that was how the term ‘BQ’ (Boston Qualifier) entered my life. I paused the film, googled the Boston Marathon, and realized just how prestigious this historic race was, and more importantly, how hard it was to qualify for it. Being a 42 year old female that year, when I saw the qualifying time for my category (3:45), my heart sank. It was more that 50 minutes faster than my current time. (4:35) Impossible! But suddenly that was all that I wanted! Taking a deep breath, I charted a plan. In my motivated state of mind, shaving off 10-15 minutes a year, over the next 3 years seemed realistic. I aspired to qualify for Boston 2017 when I would be F/45 (3:55). With this plan, suddenly I had a not-so-impossible goal for my 2014 race. I had to clock under 4:10, and 4:09 it was, as I shaved off the required 20 minutes. Step one done; I was on my way to Boston. I kept at it for the next two years. Training hard, with one focus. The next race in January 2015 saw me crack the 4 hour barrier, with 3:59 (another 10 minutes gone here). Finally, I ran my BQ at the NN Rotterdam Marathon, in April 2016 in 3:48 (the final 10 minutes! ), 6 minutes within my qualifying time. “I’m going to Boston!” I told all the finishers around me, as I smiled and skipped all the way back to the hotel! Tears streamed down my face, I was overwhelmed with emotion to see my dream of 3 years bear fruition. The Boston race is a hard one. It has constant rolling hills and unpredictable weather. So I train for what is in my control. The hills and the distance. From the beginning my coach Sandeep was clear, that I should focus on speed for the first 4 months and then hills with distance over the next 4 months. The training was planning scientifically and meticulously. I followed it to the T! Thus I did speed work like I have never done. Hard short intervals at crazy paces. I ran the Delhi Half Marathon in November in my personal best time of 1:50. Then started hill work. Long hills. Short hills. Hill repeats. Hill sprints. I did so much of that, that now, whenever I run over a hill I barely even notice it! I grew as a runner, as running uphill has been my favourite peeve over all these years! I ran moderate half marathons in Mumbai and Thane in a similar times, as training runs, in January and February. The only goal was the marquee race, the Boston Marathon on 17th April 2017. To follow my rigorous training a lot of my friends paced me during my runs, especially for the hard Wednesday and Sunday workouts. They are all stronger runners than me and this season I was determined to run next to them, shoulder to shoulder. It has been a long season, with a lot of mileage. I followed a strict nutrition plan, put in place by my dietician friend Roopali, for the various phases of the training: no carbohydrates during base building, ketogenic (high fat- high protein) during peak training, and a lighter one during taper. I was lucky to have good help at home to support this. Essentially, I cut out all the gluten, sugar, milk, refined foods from my daily routine. My carbohydrate intake was in the form of whole jowar, bajri and amaranth. This was cooked in various forms everyday; sometimes chilla, sometimes salad, and khichdi on other days. My lunch and dinner meals were a salad, a vegetable and daal, yes- minus the roti, and after a few days I got used to it! The main component of the diet was protein; this was by way of nuts, seeds, daal and eggs, which was a part of every meal. It was a topping with my fruits, sprouts in the salad, a scoop of whey in my smoothie, alfa alfa sprouts in my green juice, paneer/tofu at dinner. Adequate protein is critical for muscle recovery. High fat was composed of an avocado a day, or a bowl of full fat curd, hummus and nuts. This was the most yummy part of the diet! With this diet, my weight remained unchanged, but my body composition changed and I felt really energetic. Once I understood how the food worked, I got creative with it, and more often than not, my kids would want to eat my concoction instead of their meals! Along with all this my supplements were all in place. Vitamin C, to re-build the immunity which would drop post a long run, iron, calcium and vitamin B. I had my Fast and Up pre/post and during run drinks to make sure that I maintained my electrolyte balance during my workouts. So yes, I took nutrition just as seriously as the workouts. Following this regime of 5 days of running, and 2 strength sessions and my weekly massage, along with daily foam rolling and stretching, took a lot of planning. And this, along with real life, work, two teenagers, one taking her tenth standard board exam and one in college, is like an edge-of-your-seat-thriller! I would sigh with relief when each day ended and I slept, out like a light at 9.45 pm. There have been several days, when I was supposed be taking up my daughter’s work, but I was actually dozing, irrespective of the time of day! My family and friends have been the cornerstone of my support, who have shared the highs and lows of my training. Apprehensions have been plenty all through training. Each week as I saw the workouts planned for me they just terrified me. I never thought that I was capable of doing them. My coach Sandeep would always pacify me; by saying of course you can do it! My people had faith in me, which reinforced my faith in me. “You will shine”, rang in my ears as I struggled to complete my last 32km run. Three words got me through! Through my training, I learnt the meaning of success: To have a dream and to systematically train towards it. It has been a difficult journey to get outside my comfort zone, emotionally and physically, to push myself harder than I ever have. But the satisfaction has been immense. I am living more, giving more, getting more. Life has become richer and it all began with a dream. Never in my wildest imagination, during the first 42 years of my life would I have ever thought that I would be running the Boston Marathon. I am the most unlikely Boston Qualifier as there ever was. Sheer hard work and the love for running has brought me here today; to the start line of the most prestigious marathon in the world, to the end of my journey. If I can do it anyone can. All dreams come true if we have the power to pursue them. Running a marathon is always hard. The distance is such. What happens on race day will happen. I have done my best. That is all that I can do. Parul Sheth is a full time mother, full time runner, full time architect, a certified life coach and a published author. Over the last 10 years she has brought up two teenagers as a single parent, worked as an architect designing restaurants. She has run 6 full marathons, 18 half marathons and several other races. Naman Parul ji…more power to you god bless tc. Very Inspiring Parul ji. Wish u many more laurels to come in ur field of passion for running. Wow…. Amazing journey…. Thanks for sharing your story… it is really motivational….All the best for Boston Marathon…. you are doing it!!!! Parul, it was sheer pleasure reading your story. Very inspiring for new runners like me. All the best. Hope you enjoy your effort at Boston. You are inspiration to many and true example of women power. Hats off to you. This is a very inspiring article. May the force be with you in Boston as well. Truly inspiring…a great case of power of execution. Wish you the best. My story is similar. See you in Boston. It”s also my first time since I started running three and half years ago. All the best Parul. You will shine. A great motivation to all around you. Super commitment and discipline. That’s what is important the will to achieve. Compliments and Congratulations on your epic journey. A story such as yours is exceedingly inspirational. Best wishes for your continued success in life. 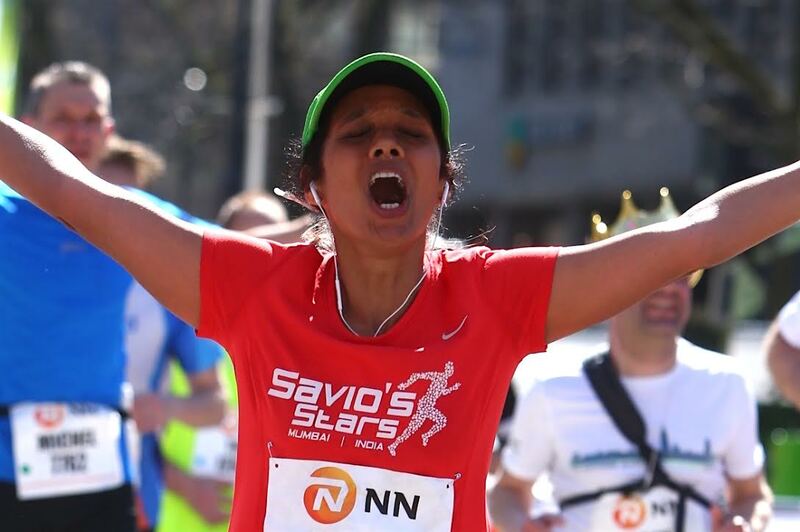 Wow Parul…i am so proud of you…how well you have written and given hope to so many runners like me.Boston is always a dream…i would definitely want to do it one day.Thanks a lot. Amazing Parul! You certainly are my inspiration!! ALL THE VERY BEST AT BOSTON!!! Keep SHINING Bright! God Bless you! Truly Motivational! All the best Parul ji.. Truly inspiring and motivating story!!!! Truly Motivational! !All the best Parul ji..Hatts off to you. Wow! Parul..u r truly inspiring .U have proved -no age barrier to achieve our dreams.All the best. years back. Much pleased to read your sharing of experiences and your regular diet and training pattern. All the Best my friend.